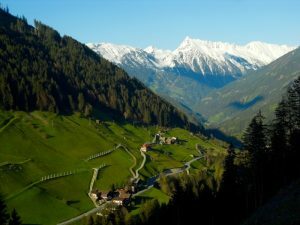 Gloria lived her entire life in a stunning valley in the Austrian Alps in a place called Innerberg. Surrounded by snowy, rocky mountaintops, she enjoyed many summer days walking the meadows of wildflowers – yellow, blue, purple, orange and white. She was a hard worker – one of the best. This is especially remarkable given the fact that she had a serious accident when she was young and she wasn’t expected to live. 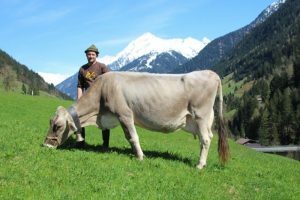 At our Simple Living Camps, we serve fresh milk from Martin’s cows and goats who graze on the near by pastures; and eggs from his free-range chickens. We purchase yogurt and cheese from local farmers who take great pride in their farm to table products. We hope you’ll join us in the future for a memorable, rejuvenating experience.